Arrive at the Cairo International Airport. Meet our tour representative who helps you with an assisted transfer to the hotel. Complete the check-in formalities. The rest of the day is at leisure and you are free to spend the day as per your own liking. Set on the banks of River Nile, Cairo is a vibrant and welcoming city. The capital city of Egypt, Cairo is full of energy and offers interesting experiences to its visitors. You can explore the surroundings. Also known as 'the city of a thousand minarets', it has several architectural gems of Islamic style of architecture. 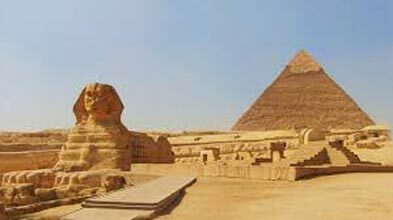 On the 2nd day of the tour, have your breakfast at the hotel and embark on a guided sightseeing tour of Cairo, which starts from the great Pyramids of Giza- one of the Seven Wonders of the World. 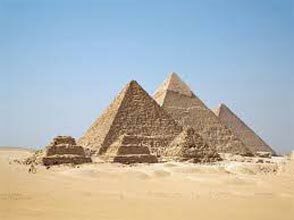 When the Greeks erected the pyramids of Cheops, Chephren and Mycerinus, guess they always wanted to constructed world wonders. 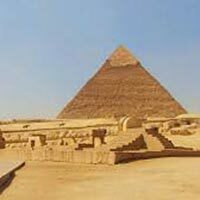 These pyramids, constructed from a single pyramid, amounting to a total of 2.300.000 blocks, are real wonders. They have always been muses for artists and writers. Out of the three, Cheops is the most interesting one. Its burial chambers are accessible to the public. Close to this the popular Great Sphinx of Giza, dating back to 2620 BC, the time of Chephren. Built from natural yellowish limestone, 65 feet in height and 187 feet in length, it has a statue that is a mix of a lion's body and a Pharaoh's head. After this, a visit to a local perfume shop and papyrus institute can also be arranged. Have lunch at an Indian restaurant and then continue with the sightseeing. The next visit is to the Egyptian Museum- founded in the year 1835 and reconstructed in 1900 in the new classical style, the museum has an amazing collection of more than 1, 60,000 objects, starting from the pre -historic time and continuing till the Greco Roman period. There are a total of 107 halls with huge statues at the ground floor. Jewels, mummies, small statues and the treasures of Tutankhamen are on the upper floors. The complex also has a huge library and a photography section. There is a separate hall for the Royal Mummies with the mummies of 11 kings and queens. Post sightseeing, a small drive passing the downtown brings you to Khan El Khalili bazaar, one of the world's most famous market with narrow alleys. This wonderful market is popular in the whole of Middle East and has a wonderful medieval feel. Dating back to the 14th century, this market houses some amazing stuff such as jewelry, carpets, oils, antiques and more. Back to the hotel. After an early morning breakfast at the hotel on day 3, get ready for a full day excursion to Alexandria, nicknamed as the 'Pearl of Mediterranean'. This lovely city is known for its cultural ambiance and a vibrant atmosphere. Get transferred to Alexandria through the desert road. Around 225 km away, on arrival, you enjoy a guided tour of attractions in Alexandria. The first visit is to Pompeii Column and Kom El Shoqafa- the Catacombs of Kom El Shoqafa, made from Aswan pink granite with a height of 30 m, the Pompeii Column is known to be a gift to Emperor Diocletian from the people of Alexandria. A major part of the remains of this place can be found at the Greco-Roman Museum. The hilltop has the entry to Kom al-Shuqafa Catacombs belonging to the 1st and 2nd centuries, discovered in the 20th century's starting. The next visit is to Montazah Gardens- covering an area of 150 hectares, it envelopes the the palace of Khedive Abbas, which is known for its stunning architecture. Take a walk here. Next you can enjoy swimming at the sandy beaches. Thereafter, you visit Alexandrina Bibliotheca- the city's new library, it is dedicated to the recollection of the scholarship and sincerity of the original Bibliotheca Alexandrina. This complex is the venue of several institutions, has around 13 varied departments too. Next in line is the visit to Qaite bay Fort. It is place at the last end of the Cornish and has been guarding the bay for centuries. Constructed in the year 1480 on the site of Alexandria lighthouse, it is crenellated walls. After sightseeing, relish lunch at restaurant and begin driving back to Cairo where you arrive, late evening. The day starts early. Have a hot cup of tea or coffee and complete the check-out formalities. Carry packed breakfast while you are driving to the Cairo airport. Later, get onboard a flight to Aswan, the southern gate of Egypt. This flight is of about 70 minutes. Upon arrival at the Aswan airport, meet our tour representative. An ancient city, Aswan lies on the River Nile and is known to be one of the best winter resorts in the world. Have a guided to the Old dam and the High dam that provide electricity and irrigation to the whole of Egypt. Next, get into a motor boat, to have a ride till the wonderful Temple of Philae, which lies on the Isis Island. This brilliant temple, dedicated to the Goddess Isis was built by the ancient Egyptians. After the construction of Aswan dam in 1906, the temple was submerged. It was only the 1970s that steps to the save the temple were taken, after the High dam was built in 1971 and the water levels were stabilized here. Thereafter, get transfer to the Nile Cruise. Complete the check –in formalities. Lunch is served on-board. Enjoy a relaxed tour on-board a felucca, a small boat that is used on the Nile. The boat takes you around the Elephantine of Kitchener's Islands and Botanical Garden, enjoying a visit to the Agha Khan mausoleum. Dinner on-board the cruise. Treat your eyes to the lovely views. This day is going to be a great affair. Day 5 of the tour is going to begin quite early. Your breakfast is packed. The day is scheduled for a day tour by coach to the magnificent Temples of Abu Simbel skirted by 4 huge stone statues of Ramses II- the celebrated 3rd pharaoh of the 19th Dynasty of Egypt. 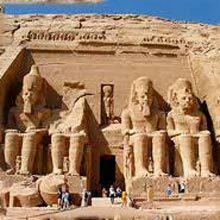 These temple are two giant rock temples in Abu Simbel. Placed on the western banks of River Nile, these temples were built by the Pharaoh himself. On returning back from the Abu Simble temple site, cruise to Kom Ombo exploring another popular temple of the region. This temple is dedicated to 2 Gods, Sobek and Heroeris. Dating back to 180 BCE in Ptolemaic era, new additions were made in the Roman times. The temple site is on the bank of River Nile. Later on, sail to the ancient Egyptian city of Edfu, lying on the western banks of the Nile. Arrive in Edfu where you get down from your cruise to visit the Temple of Horus. Get into a horse drawn carriage or Kalesh. Also known as the Temple of Edfu, it is one of the best-preserved and most complete temples in the whole Egypt. This temple was built between 237 BC and 57 BC, atop the remnants of former temples. The entrance of the temple has a huge statue of Horus. After this, go back to the Nile Cruise that starts sailing to Esna / Luxor. As you reach Luxor, disembark to visit Karnak temple. This temple complex consists of a number of ruined temples, pylons, chapels, along with other buildings. This city of temples was created in a span of more than 2,000 years and is dedicated to the Theban triad of Amun, Mut, and Khonsu. Your next visit is to the Luxor temple that looks like an open museum. This ancient Egyptian temple complex, on the eastern bank of Nile River was established in 1400 BCE. Today known as Luxor, it was the Waset city in ancient Egypt. Back to the cruise. On the 7th day of the tour, have an early morning breakfast and complete the check- out formalities. Keep your luggage on-board only as you are all set for sightseeing. Explore the west bank in Luxor city towards the Valley of the Kings- Also called the Valley of the gates of the Kings, this is the site where tombs of influential Pharaohs and nobles, belonging of the New Kingdom were built between the 16th to the 11th century BC; the Mortuary temple of Hatshepsut- dedicated to a rare female pharaoh, Hatshepsut, this temple is also called Djeser-Djeseru and the Colossi of Memnon- 2 extremely huge stone statues of Pharaoh Amenhotep III, lying in Theban necropolis from the past 3400 years. In the afternoon, you return to the Nile cruise to take your luggage. Now is the time to savor sumptuous lunch at an Indian restaurant. Lunch is followed by a drive towards Hurghada City, popular for being Egypt's luxury resort town of Egypt. The road journey from Luxor to Hurghada would take around 4 hours. After arrival, check-in and relax. Post breakfast on day 8, you are free to spend the day, as per your own liking. If you want, you can stay at your hotel and enjoy the facilities that they offer. Or, you can go out and indulge in the activities of their interest. This lovely beach resort town is extremely popular for its night clubs, swimming, deep-sea fishing, sailing, wind surfing and scuba diving. The party town of Egypt, the place was earlier a small fishing village and now it is a very popular holiday resort. You can also opt for a day's excursion to the nearby villages. This laid-back city is known for its beautiful coral reefs. On the last day, have a scrumptious breakfast at the hotel. Complete the check- out formalities. Get transferred to the Hurghada airport to board a flight back to Cairo from where board flight for your onward destination.